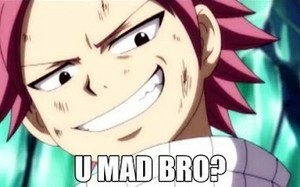 Natsu - U MAD?. Natsu wants to know if he pissed Ты off.. Wallpaper and background images in the Fairy Tail club tagged: photo natsu u mad meme fairy tail. Natsu wants to know if he pissed Ты off.